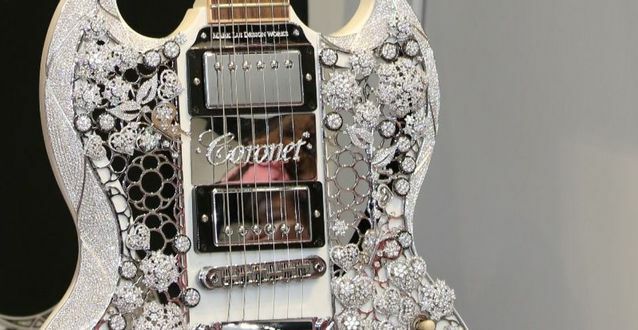 Lifestyle Jewellery, a UAE based jeweler has made a world record by creating $2 million guitar – recorded in the Guinness World Record as world’s most valuable coronet diamond guitar. Named “Eden of Coronet,” the guitar has over 400 carat diamonds set in 1.6kgs of 18 carat gold. It is a Gibson Guitars piece and was made in collaboration with Lifestyle Jewellery’s parent company Aaron Shum, while the diamonds were sponsored by Hong Kong firm Chow Tai Fook. As for its design, which was done by musician and designer Mark Lui, it features flower motifs and a variety of nature inspired themes. According to Lifestyle, the guitar’s total development process, from market research to stone setting, took sixty two artisans, three product development specialists, two project managers, and 700 days to complete. It then got verified as the most valuable guitar by a Guinness World Record adjudicator.